Cleaning your shower glass doors can be quite taxing and time-consuming. No matter how much time and effort you put in cleaning them, they get dirty with the very next use. But the water splashes in a shower are inevitable and with every splash of water on the glass, stain forming is inevitable. This gets worse in houses who get hard water in their bathrooms. The hard water leaves nasty white dots behind after the water evaporates. These white dots are calcium and mineral deposits found in hard water. Apart from water dots, a shower glass also faces soap scum and etching, which makes its appearance cloudy. 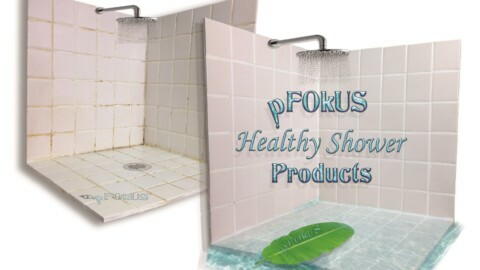 You might be using a shower door cleaner to remove these stains on a daily basis, but don’t you wish there was a way in which these stains never formed in the first place? You might be surprised to know that a greater chunk of your cleaning process is a waste of time, energy and money. Some of the cleaning tools you use might be wrong, some of the cleaning products you use might be inefficient and some of the methods you follow might be irrelevant. There are some common cleaning mistakes done by most of you while cleaning glass shower doors, thereby resulting in unsatisfactory results. Your sponge pad might be really convenient to soak in some soap liquid and scrub off nasty stains from the glass surface, but have you given it a thought that for how long have you been using the same pad? 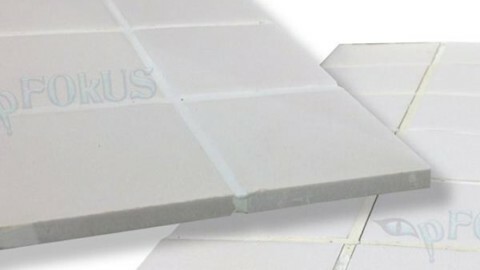 Sponge pads because of their permeability tend to sponge in a lot of dirt, bacteria and germs. Using the same dirty pad on the stains repeatedly transfers the germs on every surface you clean it with. Instead, use a soft cloth to wipe off the stains along with a high-quality soap scum remover. Using a scraper to remove the hard water stains and accumulated soap scum can lead to scratches on the glass surface, making it look ugly. To remove the hard etched stains, you can use an efficient shower door cleaner to help loosen the bonds in the hard stains and soap scum and remove them easily. If you think that they are just hard water stains and ignore them, then that is a huge mistake. 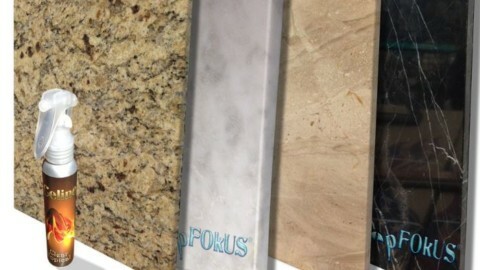 Hard water stains when left on the surface for long, become very stiff and hard. To remove them later, would require a lot of effort and time. 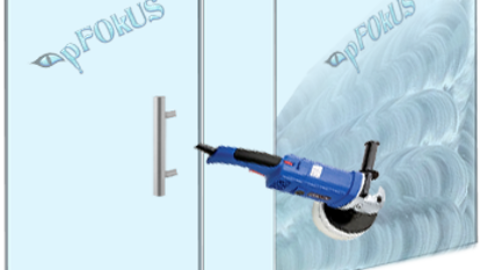 They are best removed on a daily basis, or you can seal the surface of your glass using a high-quality glass spray sealant, which forms a waterproof surface on the door, thereby preventing the formation of hard water dots. 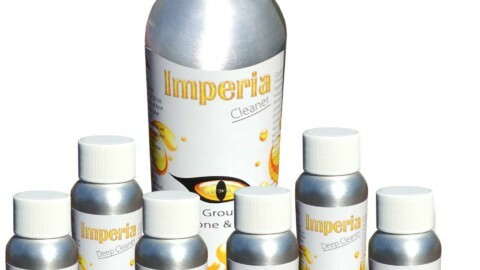 There are many acidic cleaners available in Big Box Stores which claim to remove hard water stains easily but using these acidic cleaners on glass surfaces also leads to etching. 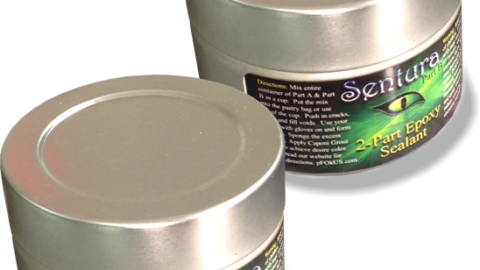 Over a period of time, you might find your surfaces to lose their sheen and luster. Instead, use alkaline-based glass shower door cleaner which is gentle on the surface and tough on the stains. You cannot use the same cleaner for cleaning every area of your bathroom. 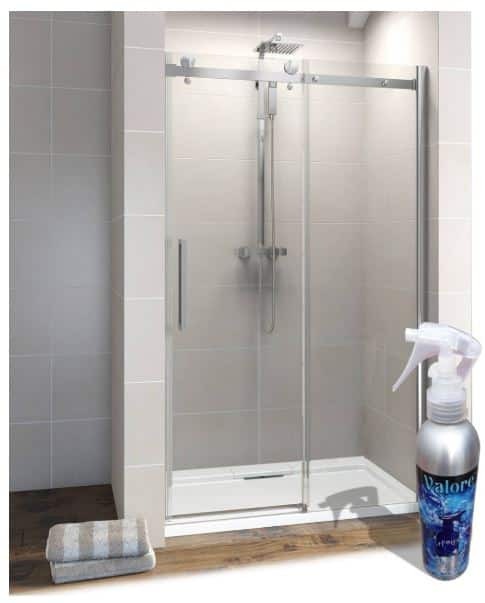 A shower door cleaner is meant for cleaning only glass surfaces, a tile cleaner is meant for cleaning the tile on the floor and tile only and a toilet cleaner can be used only for cleaning the toilet bowl. All these cleaners have different PH levels and different purposes. A toilet cleaner might have acid in it and using the same product on glass can damage the surface. If you have been ignoring sealing your glass surfaces with a good quality sealant, thinking that you can clean it regularly, then it will eventually lead to loss of luster and sheen of the surface. 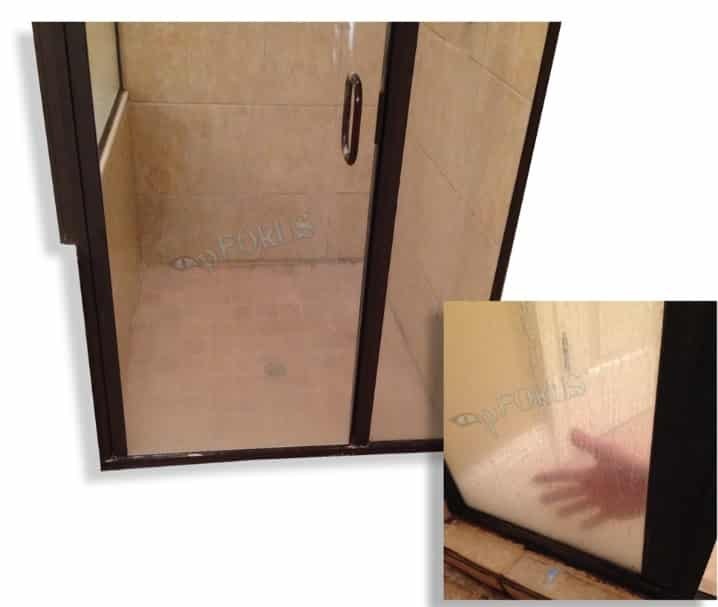 It is best to seal the glass door with a high-quality shower glass protector to prevent further stain formation. Such sealants form a waterproof layer on the surface making the water sheet off the glass and not leaving any hard water stains. Keep your shower glass clean and stain-free by following the above-mentioned cleaning tips. If you still face issues with glass cleaning, you can hire an expert from D’Sapone – one of the leading stone and glass restoration service provider companies in the US. 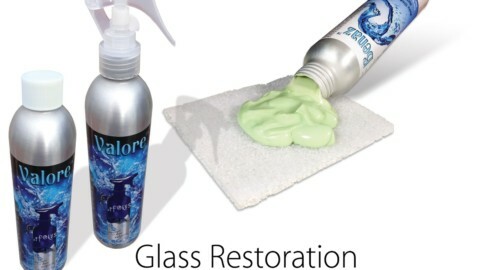 They use our products like Benaz, Valore and Valore Maintenance for their glass cleaning and glass restoration services. They are experienced in glass restoration and will not only guide the proper way of glass cleaning but will also restore your damaged glass if required.